Raw tamarind is pressure cooked and the pulp is extracted. Toor dal is pressure cooked and finished with extracted tamarind pulp. Serve raw tamarind dal with steamed rice or with roti. Makes: around 4 Servings of Raw Tamarind Dal. Wash, soak the raw tamarind in little water and pressure cook for 3 whistles. Peel the cooked tamarind and discard the peel. Squeeze the inside pulp and extract all the juice discarding any veins and seeds (around 1/3 Cup). Fry briefly, stir in extracted raw tamarind pulp, cooked toor dal, turmeric powder and salt. Serve raw tamarind dal with steamed rice or with roti. Suggestions: Adjust raw tamarind according to your taste. Dal wouldn’t cook further once tamarind is added. So make sure toor dal is cooked well before adding it to the tamarind extract. Variations: Check other recipes with raw tamarind here. Fresh fenugreek leaves are pressure cooked along with tamarind and green chiles. It is then mixed with toor dal and finished with talimpu. 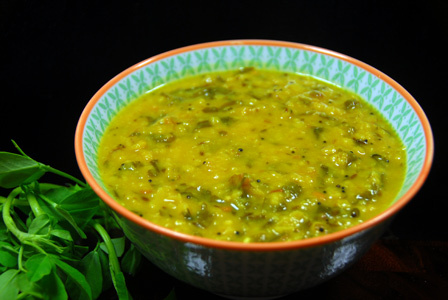 Serve fenugreek leaves toor dal with steamed rice or with roti. Makes: around 4 Servings of Fenugreek Leaves Dal. Separate and thoroughly wash the fenugreek leaves. Wash toor dal with water and strain the toor dal. In a vessel, add the feungreek leaves, tamarind, green chiles and quarter cup of water. In another vessel, add washed toor dal and 2 cups of water. Pressure cook both the vessels for 3 whistles. When mustard seeds start spluttering, add the cooked toor dal, cooked fenugreek leaves green chiles mixture and salt. Let the dal come to a heavy bubble and then remove from heat. 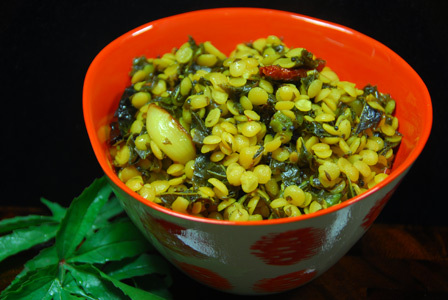 Serve fenugreek leaves toor dal with steamed rice or with roti. Notes: Make sure toor dal is cooked well. Suggestions: You can also soak the tamarind and extract the thick pulp and add it along with toor dal instead of pressure cooking it. Variations: You can also add finely chopped onion along with fenugreek leaves while pressure cooking. Other Names: Fenugreek Leaves Dal, Menthikura Kandi Pappu. 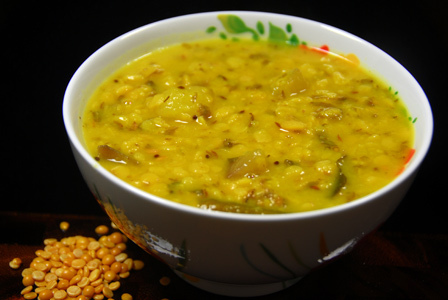 Toor dal is cooked till soft along with chopped fresh or frozen drumsticks. Whole spices are garlic are fried and cooked toor dal is finished in the seasoned oil. Serve drumstick toor dal over plain steamed rice and dollop of ghee. Makes: around 2 Servings of Drumstick Toor Dal. If using fresh drumsticks, remove ends, slightly scrape, wash and chop drumstick into 3 inch long pieces. Remove stems, wash and slice green chiles. Peel and lightly crush the garlic pods. Wash the toor dal under running water. Pour 2 3/4 cups of water and boil toor dal for around 10 minutes in a sauce pot. Add green chiles and chopped drumsticks to the sauce pot. Boil again till drumsticks change color and gets cooked (around 10 minutes). Make sure toor dal is soft but still holding its shape. Strain the cooked toor dal (if necessary) and keep aside. Heat oil in a pan, add garlic and all talimpu ingredients in order. 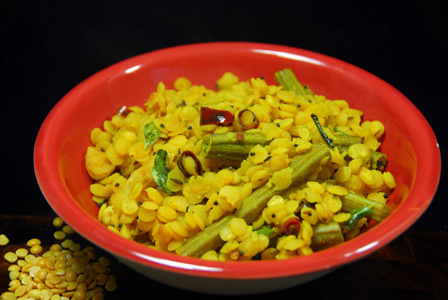 When urad dal changes color, add cooked toor dal, drumsticks, turmeric powder and salt. Fry till most of the moisture is gone, remove the pan from heat. Serve drumstick toor dal over plain steamed rice and dollop of ghee. Notes: Make sure toor dal is cooked right. Suggestions: If toor dal is not cooked properly, let it cook in the sauce pot with water. Variations: Alternatively, pressure cook the toor dal in a cup of water for 3 whistles. You can also cook the drumsticks at the same time in a separate vessel in the cooker. Other Names: Drumstick Toor Dal, Mulakkada Podi Pappu. Gongura Kandi Pappu Podi Pappu. Sorrel leaves are roughly chopped and cooke din oil along with spices and garlic. 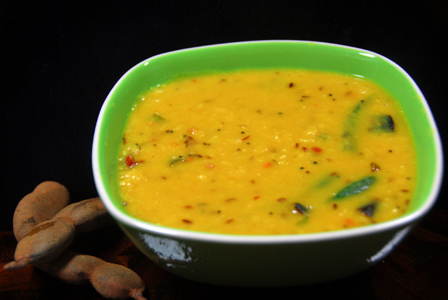 Toor dal is cooked till soft but firm and added to the sorrel leaves and cooked together. Serve sorrel leaves toor dal with steamed rice or with roti. Makes: around 4 Servings of Sorrel Leaves with Toor Dal. Separate leaves, wash and roughly chop sorrel leaves. Pour few cups of water and boil toor dal in enough water until just cooked. Strain the cooked toor dal and keep aside. When urad dal changes color, add green chiles, sorrel leaves and salt. Stir fry for a minute or two until sorrel leaves wilt completely. Keep covered if necessary until sorrel leaves are cooked. Then add cooked toor dal, turmeric powder and stir fry for a minute or two. Serve sorrel leaves with toor dal over plain steamed rice and dollop of ghee. Suggestions: If toor dal is not cooked properly, let it cook in the sauce pot with water because once its added to the sorrel leaves, it wont cook much further. Variations: Check other variations with sorrel leaves here. Other Names: Sorrel Leaves with Toor Dal, Gongura Kandi Pappu Podi Pappu.